Labour MPs are calling for women to be given a stronger voice in the Brexit process, warning the talks are becoming "just another job for the boys". A letter to Theresa May signed by 56 MPs urges her to review the gender balance of the negotiating team, one of whose nine top members is female. It warns that women's input is needed to ensure workplace rights, such as maternity leave, are not watered down. As prime minister, Mrs May is ultimately in charge of the talks. The negotiations are being led on a day-to-day basis by Brexit Secretary David Davis and civil service "sherpas" led by Oliver Robbins, the permanent secretary at the Department for Exiting the Union (Dexu), and Sir Tim Barrow, the UK's permanent representative to the EU. Of the nine senior figures listed by the government on the opening day of the negotiations last month, only one - Dexu's director of market access and budget Catherine Webb - is a woman. Among signatories to a letter calling for the make-up of the team to be reviewed is Labour's former deputy leader Harriet Harman and Yvette Cooper, the chair of the home affairs select committee. The letter points out that nearly half of the EU's negotiating team, which is led by former EU commissioner Michel Barnier, is female. "While women form 51% of the population, 32% of Parliament, 50% of the shadow cabinet and 22% of your current cabinet, women form only 11% of the UK's negotiating team," they write. "Brexit negotiations will need women's voices on mainstream issues like the economy as well as on directly addressing, for example, how we maintain workplace rights - much of which are underpinned by EU legislation. "A watering-down of workers' rights would impact women the most." Ms Harman told the Guardian that the team the UK was sending into battle was "out of touch with modern Britain" and looked like "the Kremlin from the 1950s". "This is the old boys' network at the top of the civil service laid bare," she said. "This is not a meritocracy, it is a boys club... This is a self-perpetuating oligarchy of men at the top of the civil service." There is one woman in Dexu's four-strong ministerial team, Baroness Anelay, while senior civil servants in the department include director of strategy and planning Joanna Key, director of planning and analysis Susannah Storey and director general Sarah Healey. 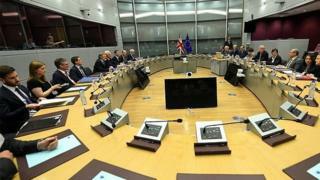 The first substantive week of Brexit talks is taking place in Brussels, with the issues on the table including citizen's rights, Northern Ireland, financial settlements and separation issues.